Delivery Note imparts information about the contents of a package. It serves as a proof of undisputed delivery of goods to the buyer. A copy of the delivery note is signed by the recipient and then returned to the seller as proof of delivery. Any products that were ordered but are not enclosed in the packaging for any specific reason, can be listed in the delivery note, which serves as a proof of the original order by the customer. Print Invoice, Packing Slip, Delivery Note & Label Plugin for WooCommerce, an easy and reliable plugin by Webtoffee extends this functionality. Delivery notes can be automatically generated with this WooCommerce extension. You can get to this section by navigating to Invoice/Pack List menu from your WordPress dashboard. When you click on the Delivery Note tab, you will be taken to Delivery Note settings. You can enable the delivery note by selecting the checkbox. Select a template from the given options or you can customize a template. Include product image and price information in delivery notes. Can remove total weight column from the product table of delivery notes. 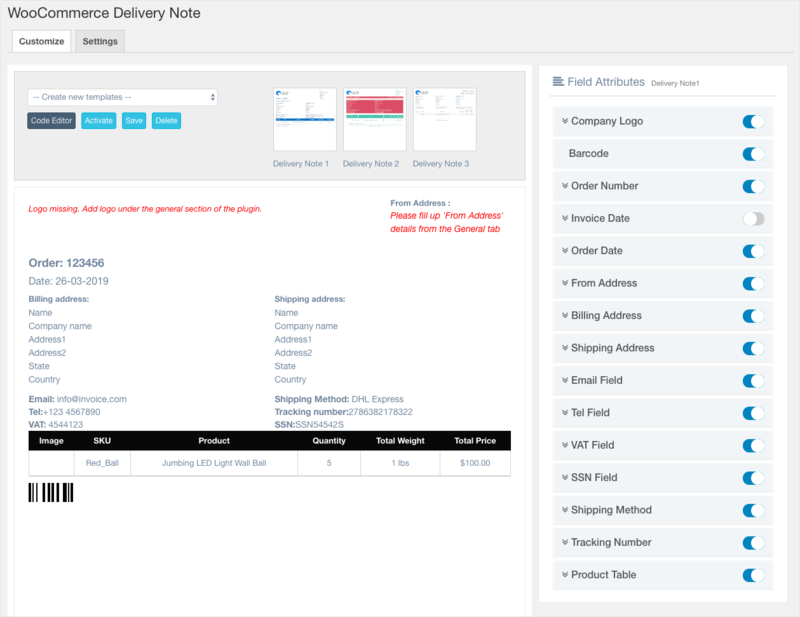 Add additional fields in delivery notes and meta fields related to the products in the delivery note product table. Enter the footer text to be printed in the delivery note. This entry was posted in Documentation, Getting Started, Print Invoice, Packing Slip, Delivery Note & Label for WooCommerce, Uncategorized. Bookmark the permalink.